My last blog post raised a few questions about the “Temple of Peace” where the implements from the Jerusalem Temple were placed. The pictures that I posted in that blog are (I think) the best of what is currently visible of the Temple. The Temple, whatever remains of it, is apparently burried under the street—the Via dei Fori Imperiali. Is there anything else of it that is visible? Well yes. 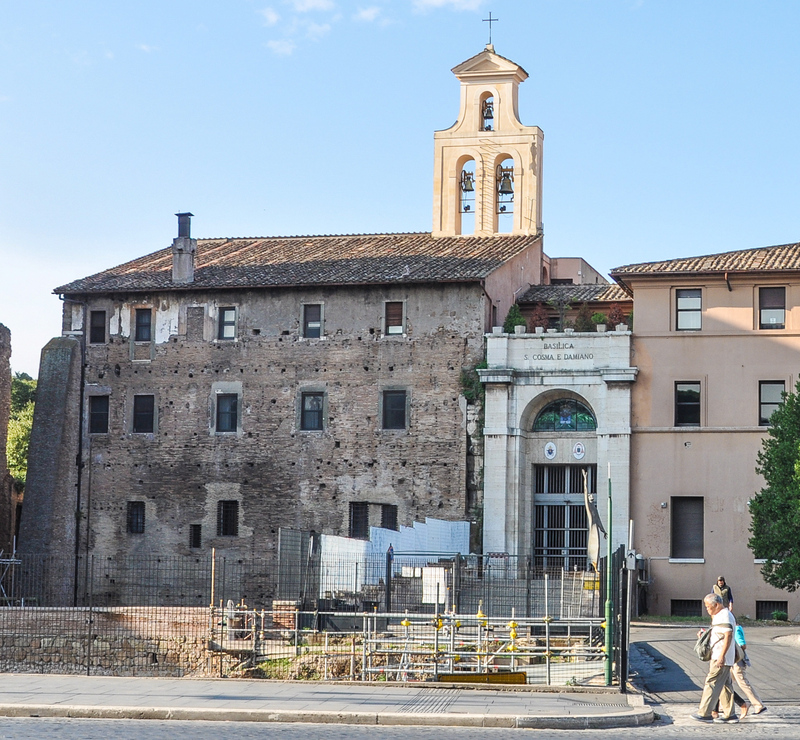 Actually, the north wall of the Basilica of Saints Cosma and Dimiano (below), that is located on the south side of the Via Dei Fori Imperiali, preserves the wall of a side room of the Temple of Peace. View looking south across the Via dei Fori Imperiali at the north side of the Basilica of Saints Cosma and Damiano. Click on Image to Enlarge and/or Download. 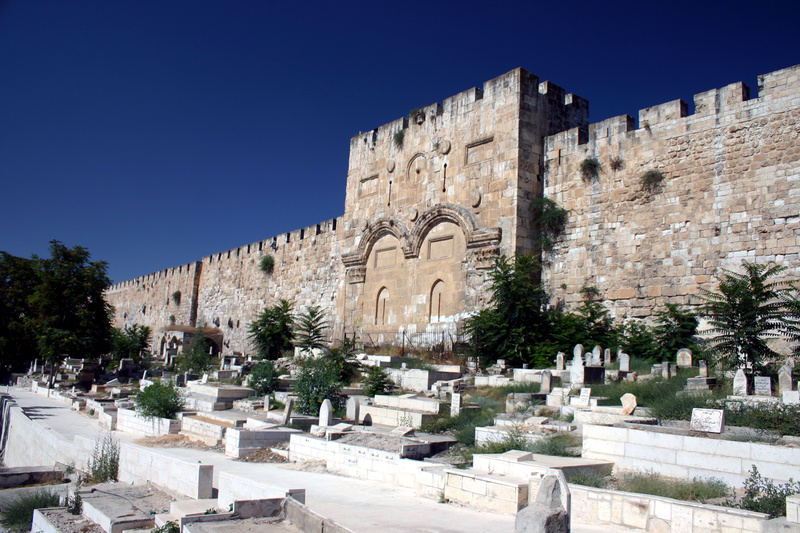 The brick wall, left of the main entrance—in white marble—is the only remaining wall of a room that was attached to the actual Temple of Peace. 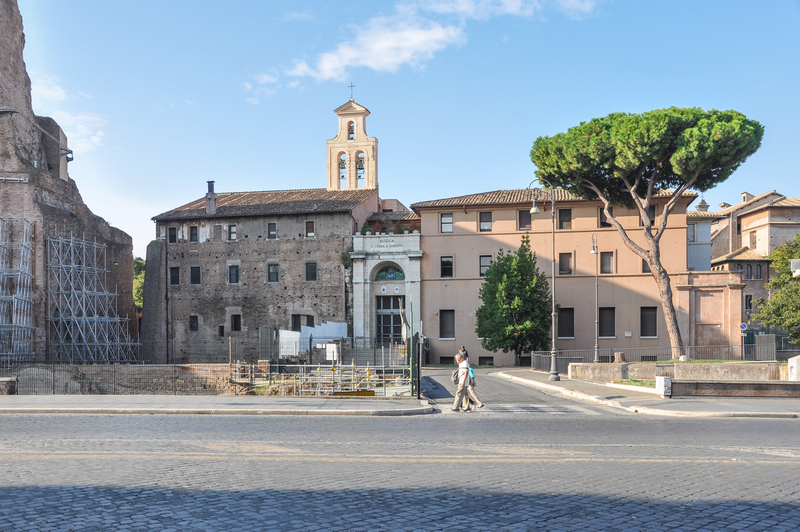 The actual Temple of Peace—if remains still exist—is probably burried under the Via dei Fori Imperiali that is in the foreground. Actually, I may have been standing just above the sanctuary as I took this picture. The brick wall, left of the main entrance—in white marble—is the only remaining wall of a room that was attached to the actual Temple of Peace. On this brick wall were affixed 150 marble blocks—note the holes in the wall where they were attached to this wall. This marble rectangle measured 59 ft. by 42 ft. and on it was inscribed a MAP of the city of Rome in the early third century A.D.! The map is called the Forma Urbis Romae and was executed during the rule of Septimius Severus, between 205 and 208. Only small fragments of it have been found to–date. Note the excavations underway just this side of the brick wall—where the Temple of Peace was located. Next post, back to the Temple Treasures. By the way, Leen Ritmeyer has published an illustrated article about the Golden Gate of the Temple Mount — Here. This entry was posted in Places in Italy, Places in Rome and tagged Forma Urbis Romae, Map of Rome, Temple of Peace. Bookmark the permalink. You have us all on the edge of our seats wondering WHERE the Temple treasures are! Also, thanks for the review and work of Leen Ritmeyer on the Golden Gate. Is that where a former JUC student “accidentally” fell into a washout caused by a heavy rain and saw buried arches below the existing arches? Yes, that’s the place. Isn’t it fortunate he had a flashlight and camera with him! Fun posts, Carl! Many thanks! Be well.